The Wow! 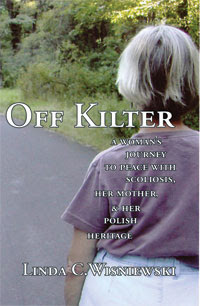 Women on Writing blog tour continues today with Linda Wisniewski's interview as she talks about her memoir Off Kilter-A Woman's Journey to Peace with Scolosis, Her Mother, and her Polish Heritage. As I read her story I was taken back to incidents in my own growing up years and the different relationships I had with my family. Thanks, Linda, for visiting us today. MJ: Tell us a little about yourself. Before turning to writing full time, I was a librarian and independent information researcher for the pharmaceutical industry. I have two grown sons- one is in e-marketing and the other is a college freshman. My husband is retired, and we’re happily enjoying the empty nest. MJ: You have a new book out. We’d love to hear about it. LW: My memoir, Off Kilter, uses my scoliosis (curvature of the spine) as a metaphor for my life. What made me uncomfortable: physical pain, my relationship with my emotionally detached mother, and the mixed blessing of my Polish American heritage – became the areas I examined and ‘adjusted’ for a happier life. MJ: You’ve recently signed with a new publisher. Can you tell us about that? LW: Pearlsong Press is named for the process that results when a grain of sand irritates the oyster, causing it to form a protective coating around the grit that becomes a beautiful pearl. Just like me, the oyster had to learn to ‘adjust,’ which makes my book a perfect fit. MJ: What do you love about your or publisher? LW: With so many authors turning to self-publishing and its lack of editorial oversight, I wanted a publisher who would take care of the entire process, from book design to final publication, without asking for a penny from me. I’m proud that Pearlsong decided to publish Off Kilter, and has done such a wonderful job on the layout, cover and all my promotional materials. MJ: What does your writing schedule look like? Are you a morning writer? A night owl? LW: I don’t have a schedule, but try to write every day, usually in the morning, sometimes in mid-afternoon. Hardly ever at night, except in my personal journal. MJ: What advice do you have for aspiring writers? LW: Write the story that wants to be told, the one that excites you. If it’s boring for you, it will be boring for the reader. Make it the best you possibly can before you even think about publishing. Join a supportive writing group. For women life writers, I recommend the Story Circle Network at http://www.storycircle.org/. This organization has online writing circles and many other benefits. MJ: What is your next project? LW: I’m working on a novel about a female ancestor from 19th century Poland, who travels here with the help of the Black Madonna. It’s a lot of fun to create her story and research life in her time and place. I’ve joined a fiction writers group and they’ve been a great help with feedback. MJ: Do you have any writing rituals? Like special music, times of the day, food quirks, etc? Seriously, I really do these two things: light a scented candle and listen to Native American spiritual music on iTunes while I’m writing. I have a cozy office we added onto our house a couple of years ago, with a lovely view onto our wooded back yard. No one is allowed without my invitation. It’s where I keep my sewing machine and quilting supplies as well, so I can easily switch from one creative activity to another. 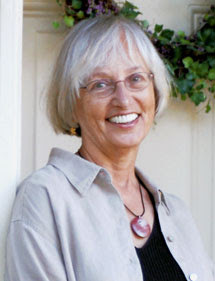 MJ: Today, writers need not only write great books, but be great promoters of their books, too. What kinds of things do you do? Since I’m also a librarian, I’m doing book talks in libraries. I also teach workshops at writers’ conferences. I’ll be in Houston at the end of February at the International Convocation of Unitarian Universalist Women (icuuw.org), for example. Bookstore signings, too. I like to connect with individual readers at events where I can talk about the book with them. And my blog tour, with this stop at Life, Unedited! MJ: Now, here is the totally off-writing subject question. What’s the coolest, wackiest, most risk-taking thing you’ve ever done? LW: Hmmm…marrying a 42-year-old bachelor? Having a baby at 43? Learning to kayak at 60? So far, these ‘risks’ have added much joy to my life! MJ: What else would you like to tell us? LW: Writing my memoir has been a journey of healing and self-discovery I didn’t expect and highly recommend to anyone who likes to write. If you give yourself a half hour in a quiet space, and write from the heart, you will be amazed at the insights you receive!